Can the Galaxy Tab carry the torch for Android tablets everywhere? 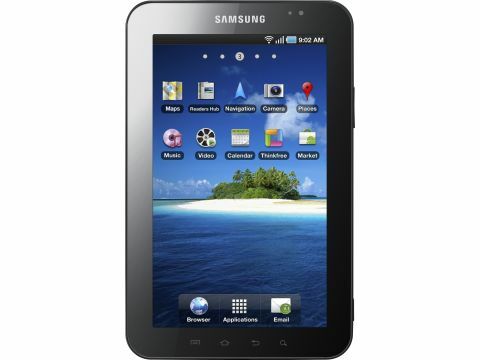 The Samsung Galaxy Tab is the first major tablet release since the Apple iPad launched about five months ago. It's been a long time coming, too. The Galaxy Tab was one of the all-time worst kept secrets in tech until it was finally unveiled at Berlin's IFA show back in September, and as the first major Android tablet release, it holds a weight of responsibility on its shoulders. With a tidal wave of Android tablets about to sweep through the tech world, it's possible that if the Galaxy Tab were to disappoint, it could damage the perception that Android tablets will be able to top the iPad on features and performance. The price certainly indicates that Samsung believes the Galaxy Tab can topple the Apple iPad from its tablet tower. The 16GB model costs £530, which is £100 more than the Wi-Fi only version of the iPad. It is, however, exactly the same price as the cheapest 3G iPad, which is clearly no accident. That price doesn't include any 3G access either, so if you want web connectivity on the go, it's going to cost you a monthly fee from one of the mobile networks. Prices will likely start at around £10 a month for 1GB of data. Once the Tab has gone on sale, you should be able to pick up a subsidised model from one of the mobile networks, in return for signing a contract. However, currently we're not sure how much these deals are likely to cost. This pricing strategy is slightly surprising - the Android tablet would be a lot more appealing if it was a bit cheaper than the iPad. Samsung's decision no doubt also has something to do with it not wanting to undercut the cost of its own Android smartphones, but it's a big risk. The Samsung Galaxy Tab has a lot to live up to, then. Especially when you consider it's a lot smaller than Apple's tablet - its 7-inch screen is dwarfed by the iPad's 9.7-incher. With a slick black and white-styled body and a bright and shiny TFT touchscreen, the Samsung Galaxy Tab gets off to a good start in that it looks absolutely fabulous. It looks every bit the iPad killer that Samsung wants it to be. And while it may look lot like the iPad in pictures, it's quite a bit smaller and feels a lot different in the hand. At 12mm it's quite thick, only fractionally thinner than the 9.7-inch iPad. As such it feels proportionately more chunky than the Apple device; not necessarily a bad thing. The body is entirely made of plastic, so it feels less solid than the aluminium-backed iPad but it still feels adequately sturdy and tough. The plastic case enables it to stay pretty light at only 380g. On the front of the device there are four touch buttons, similar to to those found on your average Android phone – one for home, one for options, a back button and one for search. On the top of the device sits a 3.5mm headphone jack. The on/off button sits on the right hand side next to the volume controls and further down that left hand side you'll also find slots for a SIM card and a microSD expansion card. The underside of the device is adorned by a charging and docking connector which looks identical to that of the iPad and iPhone. This will come into play when all the planned Galaxy Tab accessories start to spill out onto the market. The only external feature on the left side is a small microphone.